Both versions of this recipe provide an good balance of protein and fat and a moderate balance of carbohydrates. Serve it with a small extra side of carbs to make it balanced and stabilize your blood sugar. Boil a pot of water and add bell pepper halves. Boil until slightly tender, about 5-7 minutes. Once tender, remove from pot and place in a casserole dish cut side up. Set aside. In a large skillet over medium heat, sauté the garlic, chopped onion, diced red pepper and diced jalapeño with 2 tbsp of broth until tender. Add remainder 2 tbsp of broth and ground turkey to skillet. Cook until turkey is no longer pink (add more broth if needed to prevent burning). Once meat is cooked through reduce heat to medium-low. Add grated cauliflower, diced tomato, tomato paste, salt, pepper, dried oregano, cumin, chili powder and cilantro to skillet. Cook for an additional 3 minutes, stirring occasionally until all flavors are combined. Divide turkey filling evenly among peppers (about 1/2 cup of filling each). Top each pepper with 2 tbsp of enchilada sauce. *If using cheese, top each pepper with 2 tbsp of shredded cheese. Bake in oven for 5-10 minutes or until cheese is melted. Remove from oven and garnish with chopped cilantro if desired. 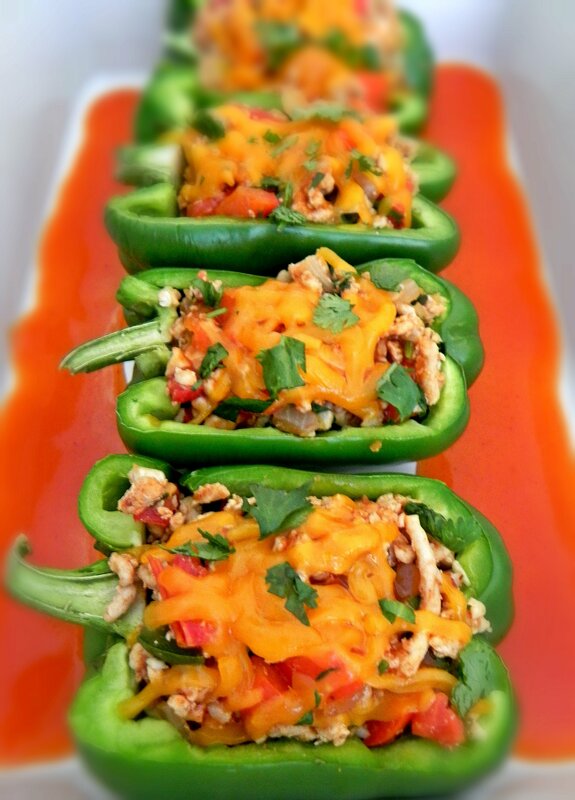 *If using avocado in place of cheese, top each pepper with 2 tbsp enchilada sauce and bake in oven for 5-10 minutes. Remove from oven and top each pepper with 1 tbsp mashed avocado. Garnish with chopped cilantro if desired. *For a make-ahead option, simply prepare the turkey filling ahead of time and store in the fridge. When ready to serve, boil the peppers until tender, fill with turkey filling, top with enchilada sauce (and cheese if using) and bake in oven. Remove from oven and top with cilantro (and avocado if using instead of cheese). This looks delicious! Can’t wait to make it tonight 🙂 Thanks for the recipe, Kristen!